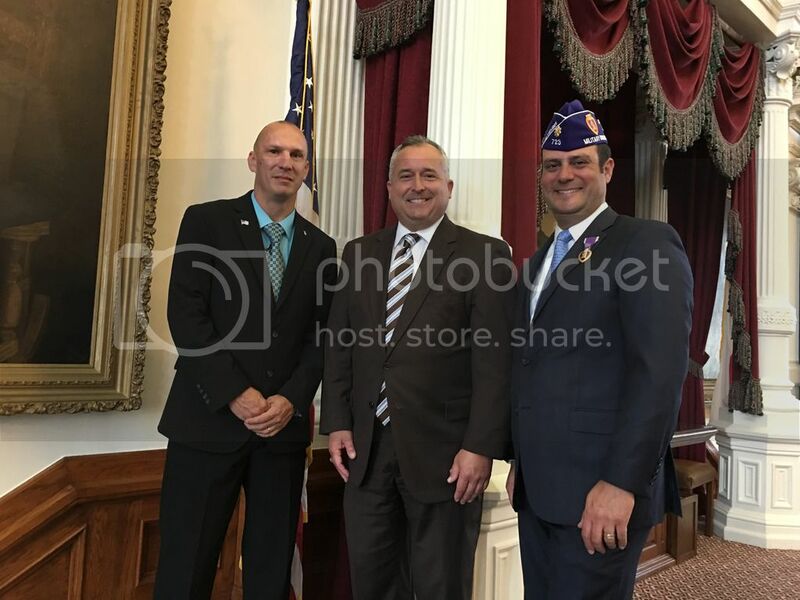 AUSTIN−State Representative Dwayne Bohac (Houston-District 138) proudly introduced House Bill 1591 (HB 1591) before the House Ways & Means Committee, which seeks to exempt Purple Heart recipients and their surviving spouses from all property taxes. The Purple Heart is awarded in the name of the President of the United States to any member of the Armed Forces of the United States who, while serving with one of the U.S. Armed Services, has been wounded or killed in battle. Currently, 100% disabled veterans are eligible for a property tax exemption of the total appraised value of their residence homestead. Under HB 1591, this same rule would extend to all Purple Heart recipients and their surviving spouses. "I believe any veteran who has served our nation abroad and defended our freedoms here at home deserve our upmost respect," said Bohac. "The least we can do here in Texas for combat wounded Purple Heart recipients and their spouses is provide property tax relief." After meeting with Purple Heart Recipient and Retired Army Major Jordan Enger who proposed the idea prior to the start of the legislative session, Bohac said he felt compelled to bring this legislation forward. Mr. Enger and former Sergeant First Class Jason Fetty recently traveled to Austin to testify in support of HB 1591 in the House hearing. Mr. Enger served over twelve years in the United States Army and was deployed to both Iraq and Afghanistan. Then-Staff Sergeant Fetty was the first Army Reservist to receive the Silver Star for valor in Afghanistan for his heroic actions at a ribbon cutting ceremony for an emergency room at the local hospital in Khost, Afghanistan for personally thwarting a suicide bombing on February 20, 2007. Although the suicide bomber eventually did detonate, Staff Sergeant Fetty's actions saved countless lives. Both Enger and Fetty were severly wounded in the blast and were awarded the Purple Heart on behalf of the President of The United States. HB 1591 would help all combat wounded Purple Heart recipients or their surviving spouses regardless of their disability rating, which is what existing property tax exemptions are based on for disabled veterans. "This bill is not about recognizing these veterans for a medal they received," said Bohac at the committee hearing. "It's about honoring them for what they gave."